When looking at stars, COROT is able to detect starquakes, acoustical waves generated deep inside a star that send ripples across a star's surface, altering its brightness. The exact nature of the ripples can allow astronomers to calculate the star's mass, age and even chemical composition. The starquakes, as astronomers call them, offer a window into the mysterious inner workings of stars. Scientists have studied similar quakes inside the sun. And they've had evidence of starquakes from very massive neutron stars. But they had not see the trembling inside another star before. The new observations were made using the European COROT satellite. The technique is similar to the study of earthquakes, in that it measure the propagation of waves below the surface of a star. 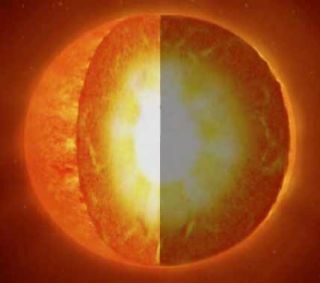 The oscillations were detected by noting variations in light emitted by the star as the surface wobbles, revealing the internal structure of the star and the way energy is transported from the core to the surface. "Other techniques to estimate stellar oscillations have been used from the ground, but they are limited in what they can do," said Malcolm Fridlund, a European Space Agency researcher. The three stars probed by COROT – known as HD499933, HD181420 and HD181906 – are similar to the sun. While the research has not yet revealed any breakthroughs of understanding, astronomers are excited about what they can now do. "The fact that COROT succeeded in probing the interior of sun-like stars with direct measurements for the first time is a huge leap in understanding stars in general," Fridlund said. "In addition, this will help us to understand, by comparison, our own sun even better." The research is detailed in the Oct. 24 issue of the journal Nature.